Everything stops for these Teapots! 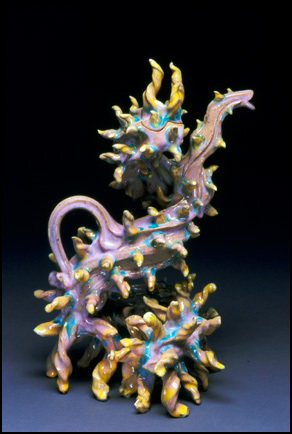 These highly original teapots from ceramicist Ray Bub are absolutely amazing! I’ve never seen anything quite like these before. 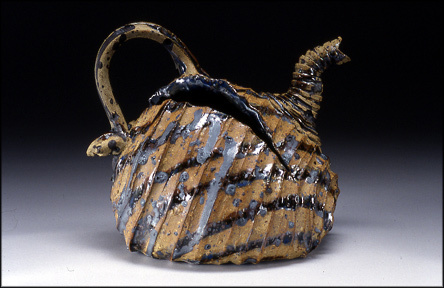 The aritst gives a detailed journey of his teapots: from their conception to their execution. 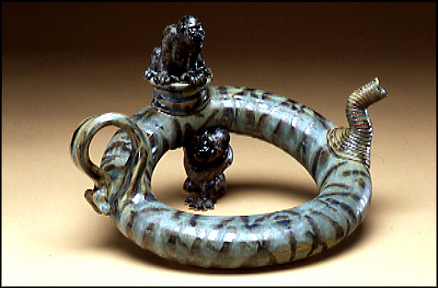 His techniques and glazing procedures are outlined here, along with lots of other amazing works. It’s that time again, so this will be a quick one. I went out yesterday and sat in the sun, foolishly with no sun factor on…. and ended up with two bright red forearms! How daft am I? I wouldn’t mind, but I’m always careful to put protection on. I wore factor 50 when I went to Vegas…and came back snow white lol! 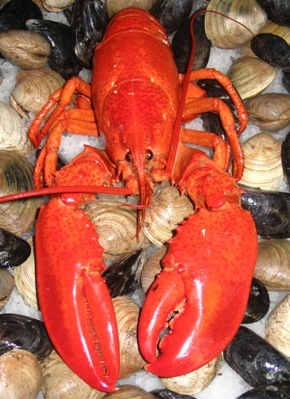 It wouldn’t be too bad if I tanned properly and went brown…but I don’t, just turn red, so may as well not bother. I now look like I have a pair of red rubber gloves on………. 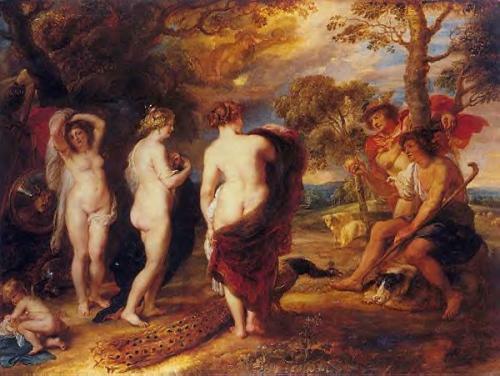 Today is the birthday of Flemish painter Peter Paul Rubens (b. 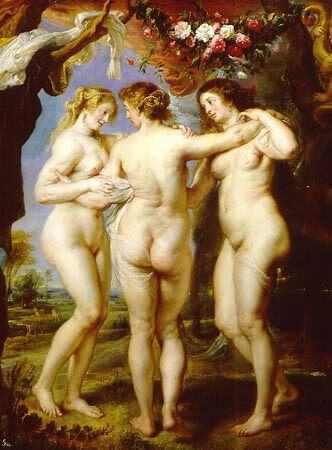 1577 – 1640). The style he is known for is Baroque. He painted mostly religious subjects for commission, also historical subjects. Here is a list of links to post I have made so far concerning artist’s birthday. I have tried to make it a rule that I actually LIKE the artists’ work! Some artists I do like, I have not included so far, as their birthdays have clashed with something else I was writing about. Some birthdays I have only found out about when it was too late to include them , I mean to rectify this at a later date. Now usually, there’s absolutely nothing worth watching on the TV, but then just like the proverbial buses – TWO turn up at the same time lol! That’s not strictly true: I got to watch both films completely, they didn’t overlap. The films I am taking about though are pretty old films and I have seen them before, but that didn’t stop me enjoying them all over again. 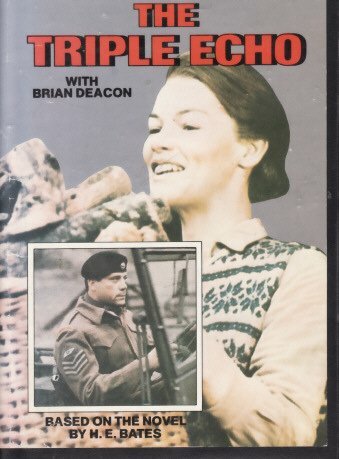 Triple Echo was made in 1972 and stars Oliver Reed (yes HIM again) Glenda Jackson and Brian Deacon. Directed by Micheal Apted, the film is based on a H. E. Bates novel. Basically, the plot, set in World War II revolves around Jackson who plays a farmer’s wife whose husband is a POW. She encounters young soldier Deacon and they become lovers. After his leave is up, Deacon decides he doesn’t want to go back to the army. Jackson hatches a plan to pass Deacon off as her sister. So she dresses him up, applies make up and ties his long hair in a headscarf and no one thinks anything about seeing him/her helping out on the remote farm as he looks like a land girl. Deacon though soon gets fed up with the claustrophobic atmosphere of the place and the emasculating way that Jackson is now treating him, so the arrival of army sargeant Oliver Reed is greeted with anxiety for Jackson and excitement for Deacon. Macho Reed is very much attracted to Deacon (or ‘Cath’ as Deacon now prefers to be called…..) and is determined to have his way with her, finding her ‘shyness’ and quietness quite a challenge. 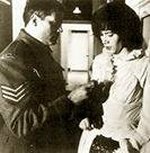 Despite Jackson’s over protectiveness (or perhaps because of it), Reed takes ‘Cath’ to a New Year dance at the army base, where ‘Cath’ soon realises that there will be no brushing off the persistent Reed. 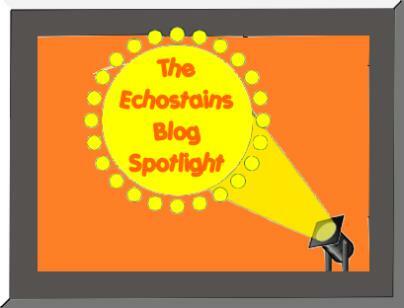 Inevitably, Deacon is found out by Reed in an excruciating way: chaos and tragedy ensue. This is not a ‘feelgood’ film: there are a lot of undercurrents which are very strange: lots of contradictions and contrasts which work very well. I’ve seen this film a few times now and it still fascinates me. 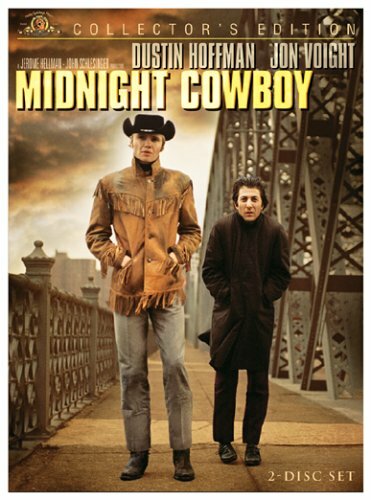 The other film ‘Midnight Cowboy’ is perhaps a more well known film. 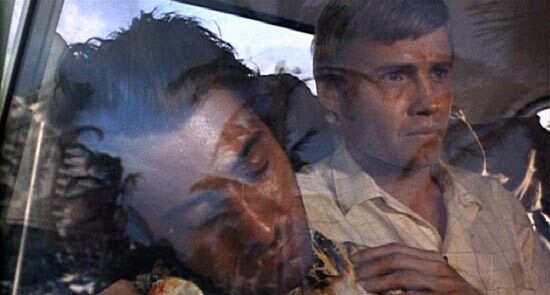 It stars Jon Voight and Dustin Hoffman (1969). Voight (Joe) leaves his small town in Texas to make it big as a kept man and gigolo in New York. Instead he becomes prey to every opportunist, including Rizzo (or ‘Ratzo’ as he becomes known), who swindles him out of the last of his money. Crippled Ratzo and cowboy Joe become a double act, without much success in the cash stakes. They become dependant on each other and after spending the winter in an abandoned building, decide to go to Florida into the sun and hopefully, a better way of life. We never get to find out if Joe makes it big, I suspect not though. Poor Ratzo doesn’t make it, dieing on the coach: the Florida sun shining on his face. It is a sad and poignant film, and in places quite touching. The flashbacks are a bit disturbing. This film was the only X rated film to win a Best Picture Oscar, and no wonder! Voigt and Hoffman are outstanding. 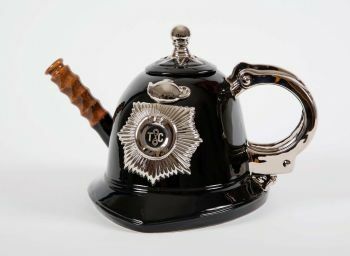 Mad about Teapots? Mad is good! 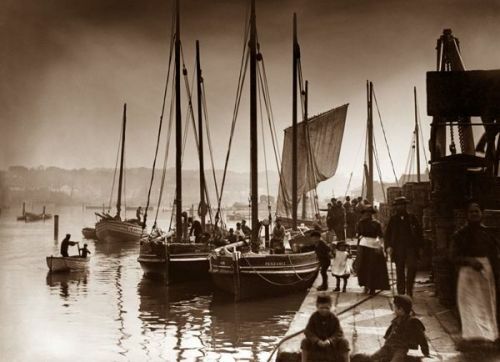 I have always loved these sepia photographs by Victorian Frank Meadow Sutcliffe (b. 1853 – 1941). I have several framed prints. Although posed, there is a certain lack of self consciousness in a lot of these photographs. It did help that Sutcliffe actually knew these villagers. 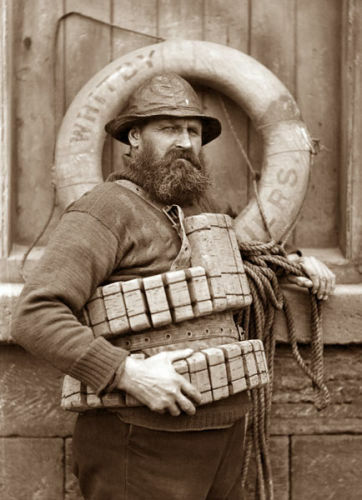 The fisher people are my favorite portraits. The character of these people shine through their faces. Theirs wasn’t an easy life, battling against the elements in order to live. They were hardy people though with loads of grit, as evidenced in their portraits. 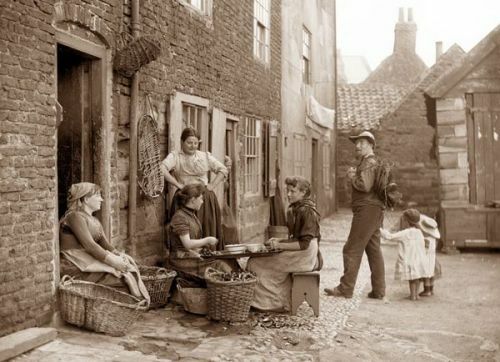 Although born in Leeds Yorkshire, Sutcliffe seems to have been fascinated by Whitby and it’s people, capturing lots of its rural life and some of the surrounding villages on his camera. 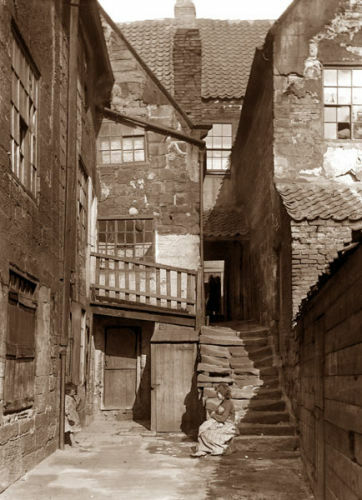 Sutcliffe had his studio in Whitby and lived just outside. Sutcliffe chronicles a life that has all but disappeared. 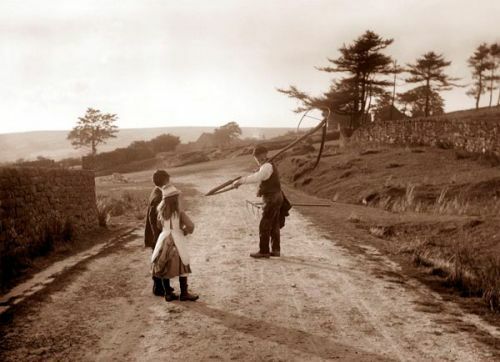 From capturing everyday working life to even the leisurely way people and animals moved down the lane. At work and at play, you get the feeling that these people communicated and cared for one another. There is a sense of community which I find quite charming. The key belief of Romanticism was the value of individual experience and individualism. 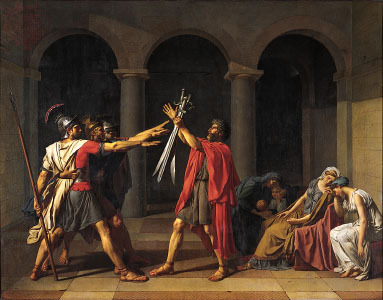 What characterised the Romantic period was the heroic view of the human struggle. Romanticism brought to the forefront the human struggle against the violent forces of nature. The major difference between neo-Classicism and Romanticism is the fulfilment of the hearts desire, whilst Classicism puts faith in intellect. Romanticism then, is a way of feeling, it gives way to full expression, whereas Classicism is a way of thought. Aesthetically and historically, Goya’s painting, ‘The 3rd of May’ is the reverse of David’s ‘Oath of the Horatii’. The latter sets up the hero, who is willing to die for the cause. Goya gives us the anti hero: the victim whose death becomes almost by chance a rallying point for those struggling against oppression. 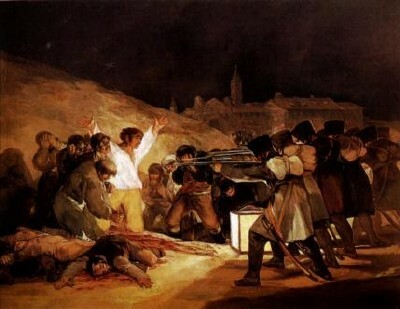 Goya’s style has few clear outlines and his soldiers echo the reverse of David’s. The central figure raises his hands in surrender: the pose is that of crucifixion: a sacrifice. The corpse lying in the foreground in a pool of blood, echoes the gesture of the central victim. The artist has effected an ‘overkill’ by shortening the distance between the bayoneted guns and the victim. The source of light comes from the lantern, which radiates light onto the white shirt of the victim, whilst emphasising the whites of the eyes in the terrified faces of the onlookers.